The outcome of two contrasting semi-finals of the AJ Bell PSA World Squash Championship – played before a sell-out crowd at Manchester Central in Manchester – will see home hero Nick Matthew bid to win his third world title when he takes on French rival Gregory Gaultier, three times previously a runner-up, in Sunday’s final of the most prestigious event in world squash. 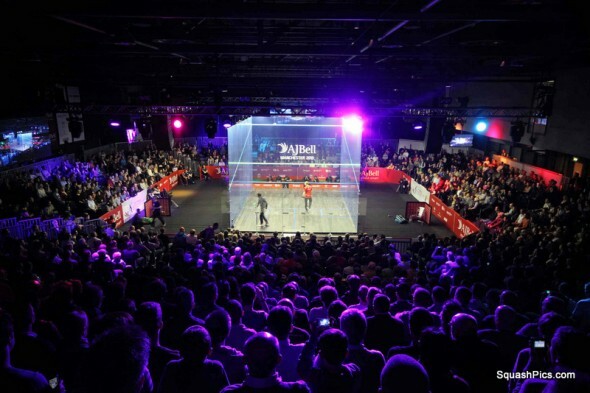 The first semi-final brought one of the longest winning streaks on the PSA World Tour to an end when Matthew, the fourth seed from Sheffield, beat Egyptian favourite and defending champion Ramy Ashour. 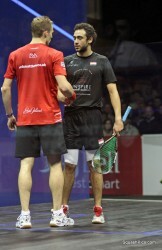 Poised to notch up a 50th successive match win since last losing to Matthew in the British Open final in May 2012, world No1 Ashour went into the match less than 100% having aggravated a hamstring injury earlier in the week. But the 26-year-old from Cairo played a blistering opening game against the Englishman ranked four in the world – taking the game for the loss of just six points. Matthew found his form in the second – reeling off seven points in a row before drawing level. But after just two points of the third, Ashour was unable to continue – and conceded the match, with the score standing at 6-11, 11-2, 2-0 in Matthew’s favour. “I started to feel it on the last two points of my match with Cameron (Pilley), and somehow managed to win against Saurav (Ghosal),” said Ashour. “I had a lot of physio treatment and acupuncture the last two days, and have been taking pills to try and relax the body and the muscles down. “I’ve been pushing on the other leg, which is not good either, because the other leg is not supposed to take as much pressure as that. 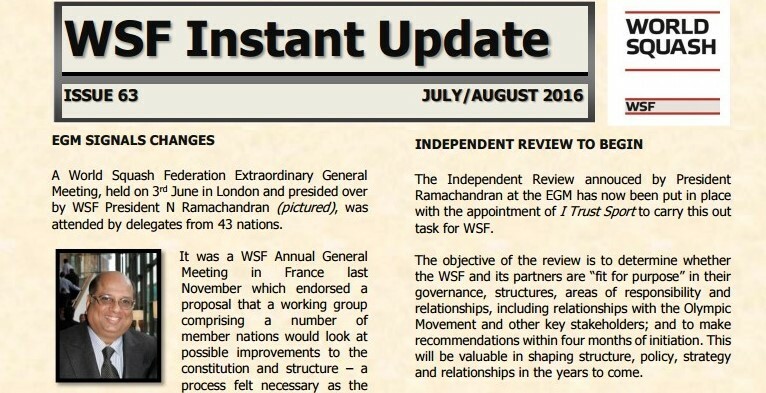 I was keeping on hoping that things would be fine, I was trying to stay positive, but …. “It’s obviously a big disappointment for me,” continued the defending champion. “I’m going to go and see what they say in Aspetar, the clinic in Qatar, to see once again what’s wrong with my legs. They say I suffer from fatigue in the hamstring, and they are not sure if there is something I can do to prevent this from happening again and again. “Now, I can’t complain, I had a good season – a great season – and I have to take that loss like a man and accept that other people had bad times as well. “But I have no fitness coach, and I’ve been stuffing myself with anti-inflammatory pills for months now, hoping that my body would hold. But the body just can’t take it anymore. 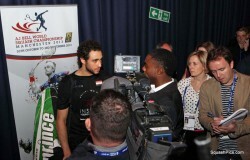 Whilst the result was the one Matthew was hoping for, the means of its achievement was not: “I feel a bit flat right now and my thoughts are with him (Ramy) and with the crowd and with everyone else really,” said Matthew, now in his third world championship final since 2010 – and the 56th Tour final of his career. “I need to make sure this doesn’t hang over into tomorrow. I have to be a bit selfish: I’m in the final. I need to focus on that. “When your opponent is injured it can play with your own mind. You have to make sure you don’t get distracted. “The crowd were brilliant today,” added the 33-year-old Yorkshireman. “They really lifted me in the first game and hopefully there will be more of the same tomorrow and they can pull me across the line. “I’m not going to have not being fresh as an excuse am I? I’m probably never going to go into a World Championship final feeling as fresh as this,” concluded Matthew. 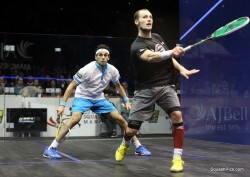 Gaultier reached his fifth successive final on the PSA Tour – which includes two titles and losses only to Ashour – after beating Egypt’s sixth seed Mohamed Elshorbagy. 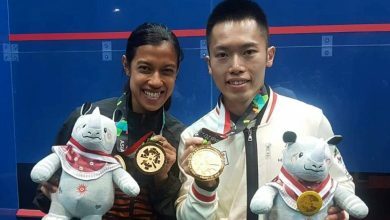 The in-form world No2 had reached the last four without dropping a game – but immediately went one game down after a superb early performance by his 22-year-old opponent, ranked six in the world. Gaultier reclaimed the initiative in the next two games to move 2/1 ahead – and extended the rallies in the fourth as Elshorbagy was noticeably tiring. 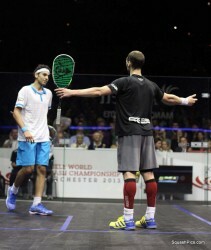 After a long energy-sapping rally, the Frenchman moved 8-7 up – and soon afterwards reached match-ball at 10-8. Elshorbagy salvaged one before a loose shot hit the tin – leaving Gaultier to celebrate his 6-11, 11-3, 11-8, 12-10 victory – and a place in his fourth final since 2006. “It was a slow start,” conceded Gaultier, now in his 55th Tour final. “He started fast and I didn’t really find my length at the beginning and I wasn’t really active so he was all over me. Then when I lost the first game I came out and my coach really got it into my head to be more focused and more active. “You know you work so hard for these kind of matches and you just try to push yourself and you push beyond the limits sometimes. That’s what it takes to win matches like this sometimes. “At the end of the third I knew he was a bit tired because he was asking for the court to be wiped when there was nothing there. 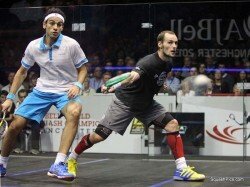 On the forthcoming final, Gaultier said: “I played Nick so many times. He’s a tough guy and he’s tough to break but I know what to do. Who is the best on the day will win. All I need to do is to recover well from today.